Heavenly Husband (Isaiah 54:5)- In the first few years after my divorce, I threw quite a pity party for myself. Why did EVERYONE else have someone, but me? What was wrong with me? My husband didn’t want me after 7 1/2 years of marriage and no one else did either. God spoke to my heart and called me to Himself. I realized that there was not a man on this earth who could fill that hole in my heart. Only God could fill the empty hollows of my heart. It was at that time that I made a commitment to God. I made a commitment to only worry about growing in my relationship with Him, after all, this was the only relationship that really mattered. I have been faithful in that promise and God has been faithful as my Heavenly Husband. Don’t worry about finding your “soul mate” or “Mr. Right”. Don’t chase your tail, wasting your precious time on unworthy guys. The most important thing you can do is grow your relationship with God. Grow closer to God and then Mr. Right might find his way to your door or maybe God has simply called you to Himself. Provider (Matthew 6:26)- As my kids were growing up, I worked part-time jobs. I felt very strongly that my first job as a single mom was to be at home with my kids. In those years, God always provided. For years, when the kids were growing up, every time one of them would grow out of their clothes, some one would call with clothes that fit that child. Other times, bags would appear on the porch full of clothes that fit the child in need. We have never gone without our basic needs. I have struggled with keeping cars going, but God has always seen to it that we get from point A to point B. We have never been without food. Even at Christmas, we have had more than enough. I have always felt secure knowing that the God of ALL resources is looking out for me and my kids and will provide what we need. Take your needs to God and trust that He will provide for you. Worrying yourself sick is not doing you or your kids any good. Allow God to be God in your life. Remember, He has access to ALL the resources on earth and will use them to provide for you. Trust Him! Healer (Jeremiah 30:17)- The first few years after my divorce were hard. I was devastated. I sank into the pit of despair and could not see the light. It has taken some time, but God has healed me of the wounds. There are still times when things get to me. I am human and I have a sensitive heart. In those times, I feel the comforting arms of my God wrapped around me, letting me know that everything will be okay. I am okay. I can feel the emotion and then I let it go. The hurt and anger doesn’t have the hold on me as it once did. Healing is a process and can take years. Allow God to wrap you in His comforting arms. Allow Him to heal your broken heart. He is waiting single mom. Allow yourself to be vulnerable and open to the ONE who truly cares. Compassionate (Psalm 103:8)- Through the years I have felt like no one cares. I have reached out for help and was met by a slammed door. Even Christians can be judgemental and unwilling to help. When I felt like there was nowhere else to go God met me where I was. I didn’t have to bang the door down to get Him to help me. God in His compassion saw me and helped me. He saw me in my pain and came to me. He heard my cries for help and He answered my prayers. God is a God of compassion and He sees your tears. He hears your cries. He knows your pain. In His compassion, He will help you. When the people around us fail, God never will. Redeemer (Job 19:25)- MY REDEEMER LIVES!!! HIS NAME IS JESUS!!! God’s will is that we ALL be saved and that none should see the fires of Hell. Our ever loving and compassionate God sent His one and only Son to die a horrible death so that you and I should have eternal life with Him in Heaven. I can’t even imagine what it would feel like to lose a child. To have a child suffer and die would be beyond heartbreaking. If God is compassionate and is capable of loving us enough to allow His child to die for us, just imagine how heartbreaking it was for Him to allow His Son to suffer such cruelty. I don’t deserve God’s love. I don’t deserve His mercy. God didn’t care that we are and have always been an undeserving bunch of misfits. He chose to save us anyways. Why? He loves us that much. 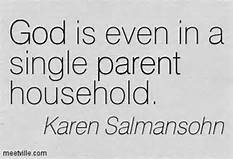 GOD LOVES YOU SINGLE MOM!!! Open your heart and embrace the love that He freely gives. If you are a single mom and are struggling in this season of your life, I am here for you. Let me know how I can pray for you. You are not alone. We are in this together! God loves you, single mom and so do I!